In 1861 the 17th Century building that stood here suddenly collapsed, killing 35 people. A young boy, Joseph McIvor was the only survivor. His rescuers heard him shout from the rubble. "Heave Awa Lads I'm no deid yet". In honour of Joseph's miraculous escape, the building that replaced it was called 'The Heave Awa Hoose'. 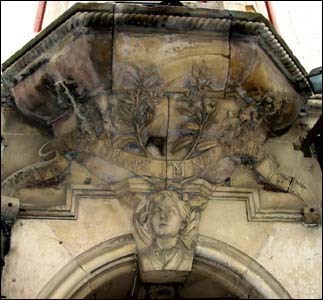 and an ornate lintel with a carving of Joseph McIvor's head acts as a reminder of the event. By the middle of the 1800's the old town houses were at least 300 years old and crumbling. The collapse of the building prompted a public outcry and an enquiry into the appalling living conditions in the old town. The rich had long since moved out to the wide streets and open space of the New Town and there was quite simply no investment in the old tenements.